Paul lives in North Fort Myers Florida with his wife Sandy and their beautiful American Cocker Spaniel, Samantha, who is the inspiration for the dogs he writes about and are a special part of his books. Quick, Quick, Slow is the fourth book in the Matt Preston Series and is given life through the many interesting people he meets and the tales they tell him. Born and raised in Seattle and now transplanted to Florida, in addition to writing, Paul keeps busy learning to ballroom dance and working on an HO scale train layout. A graduate of Western Washington University in Education, Paul taught for 4 years and became self employed when he left teaching. Over the years Paul has owned and operated many businesses, where he met many fascinating people who always seem to confide the most astonishingly personal information to him, hence the varied knowledge of people. Quick, Quick, Slow: A Matt Preston Novel is a sleuth mystery novel written by Paul Shadinger. Before everything seemed to go drastically awry, Matt’s biggest issues had been an increasing sense of boredom with the poker games that had been part of his life for so long and which seemed to have changed into a somewhat boring and silly waste of time. Winning a game that he hadn’t even known how to play that night seemed to underscore that sense of dissatisfaction. As he was driving home that night, he also started thinking about Nicky, the young Middle Eastern waif who had appeared on his front step one night along with her dog. He had taken her in and was pleased to have done so, but her recent attempts to seduce him were troubling. He was so much older than she was, and he just wasn’t interested in the commitment and complications that such a development in their roommates situation would entail. His malaise was interrupted, however, when Nicky announced that Ilox had summoned her. Matt knew Ilox was not to be trusted. When he learned that a Vietnam buddy who had saved his life had also been summoned by Ilox, Matt decided that he would not let Nicky go on her own. Their final destination would take him back into a war zone. 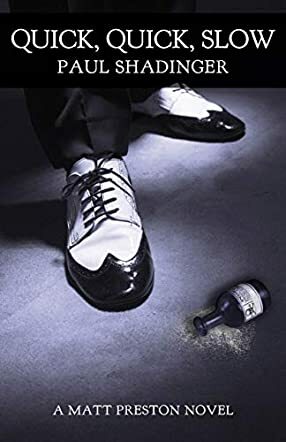 Paul Shadinger’s sleuth mystery novel, Quick, Quick, Slow: A Matt Preston Novel, is a thoroughly enjoyable hard-boiled detective tale that will thrill fans of that genre. I loved encountering Shadinger’s sly references to poker games, houseboats, and collector cars, and those brief passages had me fondly remembering those great authors of classic mystery novels. The author’s characters are finely drawn and authentic, and the scenes set in Seattle, Florida and the Middle East easily transport the reader to each of those locations. Quick, Quick, Slow is a thinking person’s novel that is never predictable and constantly keeps the reader guessing and on their feet. And while it’s not the first book in the series, the author gives more than enough background information to allow it to be enjoyed on its own. Quick, Quick, Slow: A Matt Preston Novel is most highly recommended.